raffio baskets with the other grandmothers, "Prepare the lunch, fetch the firewood, and pull the weeds in the cassava field. After that, you can be the scholar." It is all that Nassali really wants...to be able to attend school with her older brother and the other boys of the village. She listens to their talk, and admires their learning. Sometimes, she even pretends that she is at university in one of Uganda's top schools. Her job since the death of her mother is to be in charge. Every day, the same old chores. One night, when she knows that her brother is finally asleep, she takes his school book and tries to teach herself to read its message. Tired from a full day's work, she is soon fast asleep. 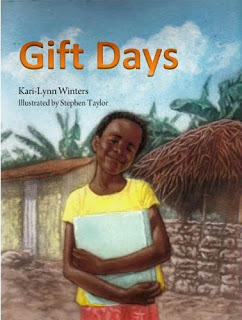 Baabawe takes his book back, while also recognizing his sister's dream of an education. The next day she takes her sisters with her while she follows her brother to school and listens outside the school window. It is a long trek in the hot, hot sun. But, she is excited about what she hears. That night she cries to her grandmother and her uncle that she wants to go to school, too. They will not hear of it. A surprise is in store the following morning...all her chores are done for her. She has time to practice letters in the dirt. She remembers them from reading her brother's book. There are even more surprises in store for Nassali. And then, she surprises everyone else! there are many children around the world who are not afforded that right, especially young girls. There are numerous reasons for this lack of education. A note at the back of the book explains why, and what is happening in Uganda in particular. Naasali's experience of no school is shared by far too many.